But but… wouldn’t the car on top get a free ride if they parked just as you went underneath them? For some reason this reminds me of early/mid 90s minivans. Drive fast enough, you can go straight up a wall. I’ve always fantasized about bypassing bumper-to-bumper traffic in my rocket-powered plane-car. At the push of a button I’d blast off over all the stopped cars. 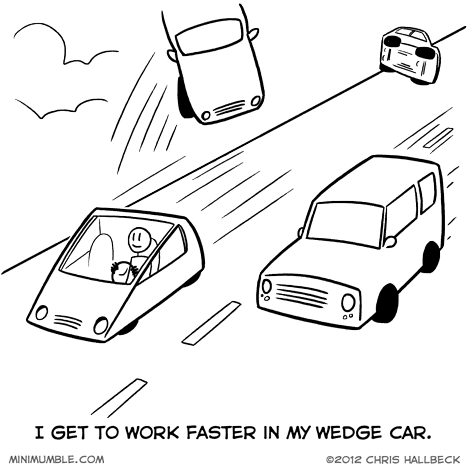 But a wedge-car! Never thought about that! I might start having fantasies about that from now on. OMG I need this like nothing else. so, i cant help to think, depending on how fast your going, that the cars, no matter what, wouldn’t fly off like that, they would, on a higher note, not move, unless the wedge hit the ground which would make it innadvertently slower, and cause it to make sparks. I often get the same thoughts every time I go into even (relatively) small Montana cities, after having moved from the east coast to rural Montana. I’ll be visiting back east this July. I wonder how much of a shock all the cars will be. I’ve never understood why people speed ridiculously on the interstate. It would be one thing if I only saw one person doing it, but everyone passes me when I’m going 65 in a 65. I really have to wonder, do none of you have the time management skills required to plan for time needed for transportation? I mean it’s not really that hard. Sure I realize sometimes you go faster than you think you are, I do it too, but is it really necessary to pass anyone who isn’t going ten MPH above the speed limit, even in the slow lane? !